Nothing last forever and that includes the most grandiose skyscrapers, luxurious hotels and beloved sports stadiums. It seems amazing at times that so much money, energy and material is invested in structures that ultimately get torn down so quickly. From amazing explosions to botched implosion, some of these demolitions are simply damned impressive while other instances are downright frightening. In true Las Vegas style the New Frontier went out with (sorry, the pun had to be made) a huge bang. Watch explosive fireworks shoot outward through the windows of the building – all captured in closeups as it happens. Truly a genius way to destroy something. Watching this one it is almost impossible to believe that it can end well: you have an extremely tall building surrounded by other structures that has nowhere to go but down. Sure enough, though, the experts did their homework and went off quickly and without a hitch. If you had to make a list of frightening, gigantic and durable structures that might seem impossible to destroy a nuclear cooling tower would probably be pretty high on the list. The Trojan tower’s destruction actually happens surprisingly fast in the first video so be sure to watch the second one to catch it in slow motion! This stadium really goes down like dominoes on a scale you’ve never seen before. While the above video gives you a general idea of how it happens you should be sure to check out this video (which couldn’t be embedded here) for a more comprehensive view of the events. OK, so this isn’t a building demolition in the typical sense: it is just one crazy individual with a sledgehammer and no sense of self-preservation whatsoever. It starts off a little slow but as you might guess while watching the beginning: the end is worth sticking around for. 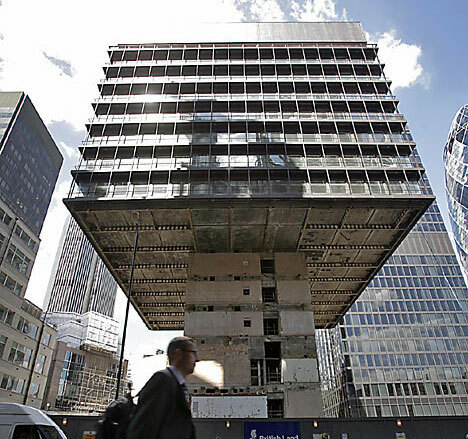 The burning question on everyone’s mind regarding this building is of course: was it supposed to fall on its side? It seems like any other implosion until a few seconds in when the building stops collapsing and begins to simply lean and then fall over still partly intact. Was it planned that way or simply a dangerous mistake? Something clearly went wrong here. Could it be that they didn’t lay out enough explosives, or that perhaps they were put in the wrong place? Whatever went on one has to wonder: who is going to get close enough to this half-toppled building to set up more explosives and try again! The sequencing on this one (with or without the background musical beats) is pretty neat. You can watch as they blow out each floor with bits and pieces flying from the structure before the whole thing collapses. Also, the video’s creator has a slow-motion version at the end. Like the New Frontier: if you’re going to blow up a building anyway, why not blow it up in style? When the infamous Stardust was destroyed they decided to do just that. The building’s implosion is accompanied by fireworks that mingle with the explosions as the structure breathes its last. Many building implosions start equally all around the base of the structure or are set off in such a way that they that the structure collapses in toward the center. This one seems to lean ominously as explosions start from one corner and the building falls slightly more to one side. This structure and implosion are both fairly modest. What stands out in the video is how close the onlookers seem to be and the visibility of the explosions going off inside the building. This appears to be a big event in a small town judging from the cheers. This one goes by extremely fast. It sort of looks like some high-speed racer shot into the building’s base at one side and plowed through to the other, collapsing the structure along the way. Now this Intel building is a bit unusual: it sat idle for almost a decade, partially constructed, before they gave up on and decided to demolish it. The net result is a somewhat strange demolition of what is essentially a collection of columns, beams and unfinished floor platforms. The Jamestown Bridge in Rhode Island went down in what can only be described as a choreographed dance of destruction. Almost elegantly simultaneous, the explosions help the main bridge structure shed all of its tension supports in a matter of seconds. Beautiful. And now for the grand finale! The above shows a number of buildings being blown up (or down as the case may be) and it is still just the tip of the iceberg. Be sure to see more building implosion and demolition links to videos, images and more at Look at This dot Com.